Writing a perfect-as-possible resume is crucial in today’s job market. Diagnostic Medical Sonographers are expected to have excellent writing and oral communication skills. The first proof a person has mastered writing skills is a well-written sonographer resume. However, it is important to understand the principles for creating a stand-out resume before the writing begins. A resume should use the right format, be focused and contain information that targets the available job position. The first thing to understand is that there are different types of resume formats, and each one accommodates the job searcher’s circumstances. An ultrasound technician with little or no experience will arrange the information differently than a sonographer who has worked for two or more employers. The reason is simple: Each format emphasizes information in a way that suits the applicants history. Reverse Chronological – The employment history is cited from the most recent to the oldest and indicates the dates of employment and employers. It is suitable for newly registered sonographers who are changing Allied Health career paths and have a clear employment and educational record or experienced sonographers who have a solid work history with more than one employer over a period of time. 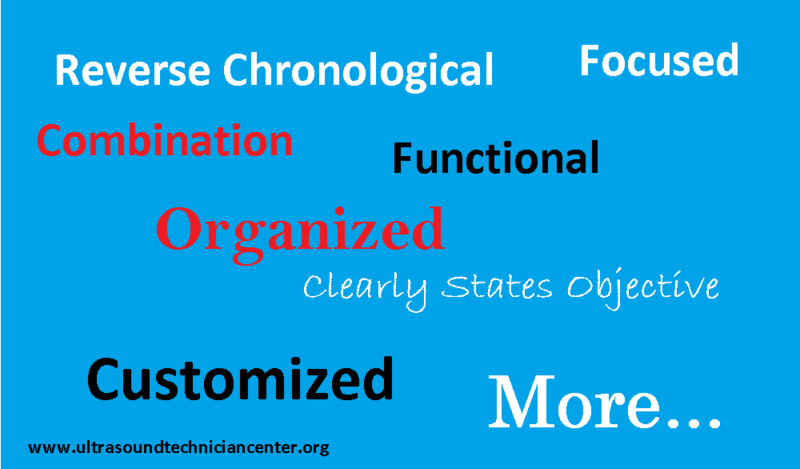 Functional – This format is ability-focused rather than time-focused. It is an excellent format for sonographers recently graduated and/or recently ARDMS registered because it emphasizes and groups experiences and achievements by competency area rather than listing specific jobs. The format includes non-paid work, like volunteer activities or experiences while in the sonography program, that shows skills and relevant competencies. If there is any employer information to include, it is added towards the end of the resume. Combination – This resume format combines two forms of resumes – reverse chronological and functional. The functional summary appears in the first part of the resume, and the reverse chronological information follows. Curricula Vitae (CV) – The CV is not used by new graduates very often because its purpose is to showcase professional and academic activities. There are certain qualities found in every high quality resume prepared by a sonographer. Focused – The primary information included on the resume is relevant to a career as a sonographer and makes it easy for the reader to zero in on the qualifications and capabilities of the job applicant. Filling a sonographer resume with irrelevant information will make it appear the preparer is filling white space. Organized – The information must be presented in an orderly fashion, making it easier to read and ensuring critical information is included. The resume should have an object statement, summary of education and clinical training, employment or unpaid work experience, competencies and capabilities, memberships in sonography or other Allied Health associations, and credentials and licenses. Clearly States Objective – A well-written objective appears at the top of the ultrasound tech resume and clearly states what the job applicant wants in terms of a position. It provides a quick summary of the end goal. Customized – It is always best to customize a resume to target a specific job position that ultrasound student is apply for. People sometimes try to save time by developing a single resume that is one-size-fits all. That type of resume is quickly spotted by experienced reviewers. For example, if knowledge of safety guidelines and HIPAA is required then mention personal knowledge in the resume. Sonographer Resume writing is a bit of an art form because the final product needs to be stylish, appeal to the viewer, attractive, informative and memorable. A Diagnostic Medical Sonography student who recently graduated may believe there is little information to put on a resume due to lack of work experience, but that is not true. The first lesson of “Resume Writing 101” is to learn how to showcase the applicable skills, competencies, abilities, talents and personality. QUIZ! Is being sonographer a right career for you?